The book I review today is an excellent one on history, geography and sustainable development. 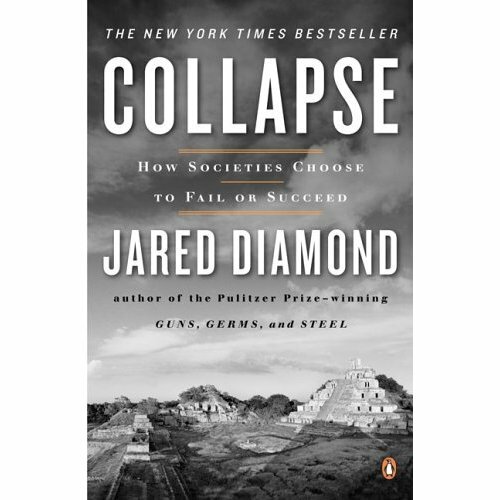 Dr. Jared Diamond’s idea when writing it was to compile facts and figures about societies’ collapses and failures. This is done in order to allow us not to repeat the same mistakes done by the Maya, the Vikings in Greenland and many ancient civilizations that ended dramatically. During nearly 600 pages, the author gives an impressive class on those civilizations and why they failed and died. The last part of Collapse is dedicated to how WE can avoid big problems in the very next decades. Perhaps the best book I read this year. During most of this bestseller, the author puts a lot of emphasis on how ancient societies disappeared. The environmental issues were important but do not explain everything. Indeed in Greenland, two societies were present. One disappeared (the Vikings) when the other (the Inuits) survived. 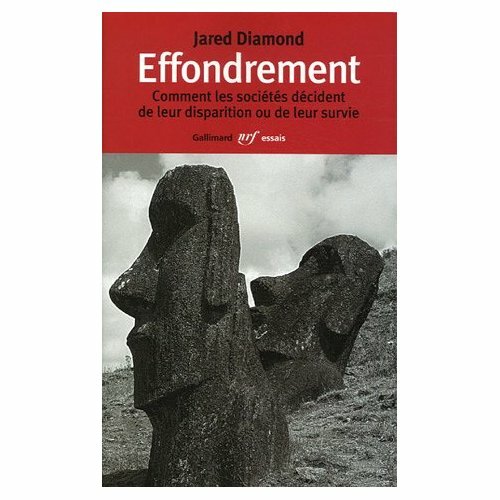 But Diamond also tackles extensively some ancient civilizations which ultimately succeeded in managing their problems in a right way and thus gives us hope. If New Guinea, Japan and the island of Tikopia succeeded, why couldn’t we ? (…) deforestation and habitat destruction, soil problems (erosion, salinization, and soil fertility losses), water management problems, overhunting, overfishing, effects of introduced species on native species, human population growth, and increased per-capita impact of people. To Diamond, even if we solved eleven of those issues, the twelfth could still consist failure and thus collapse. But most problems are intertwined, so solving one would help in solving others. As an example, afforesting can help in preventing soil and water problems. Even if the book is quite pessimistic as it shows many powerful societies that died out, there is a lot of hope as solutions exists. As an example, the Dominican Republic succeeded in recent history to solve its problem when Haiti failed on the same island. Diamond works show that troubles generally arise from massive tree cutting with soil erosion and so on. Respecting nature is respecting Mankind and thus allow us to make money now and tomorrow. Not respecting it might indeed allow businesses and people to profit in a huge way now but will mortgage our future. If no drastic changes toward sustainability were done fast, trouble would arise or already arose. Some countries are already at risk but with globalization, they would quickly arrive at our doorstep. As Viking Greenland history showed, the people at the highest level of the ladder just earned themselves the right to be the last to die of starvation. So, sustainability is not something for rich and well fed people but also for the poor and starving ones as if they don’t protect a minimum the scarce resources they have, they will make matters worse in the short run. Something like this happened in Rwanda and Somalia in the 1990s. This is why people in India and in many other countries are afforesting and protecting their natural assets now (see the article of Tuesday on afforestation). It is often said that large companies do not care about the environment and people. But it is not always the case as Dr. Diamond shows. Some large companies already moved toward sustainability on a local or global scale and thus minimized the impacts of their actions on the environment. Those companies understood all to clearly that if they want to remain profitable in the long run they have to manage in a sustainable way the resources they are using and will use in 10 or 30 years from now. The author has been working with both environmentalists and large companies and thus can provide insight from both. The last two chapters provide most interesting data as it explains that we are the basis of the system and how we can act on companies and countries. South Africa stopped apartheid because of massive boycott. Both bottom up and top down management systems are effective. This means that governments can work on a cleaner environment but we, as individuals, have to act in a sustainable way too. Dr. Diamond also gives some hints how people like you and I can act and make a huge change on Earth and Mankind’s future. Among these advices are voting or buying or not buying some products, two examples of bottom up solutions. Furthermore, some arguments that are heard from sceptical people are tackled in a great way. The author thus shows the gravity of the current situation and also explains why people who think sustainable development is a luxury we can’t afford are wrong. At the end of the book, one can find a huge further reading section as well as an index. So even when you think you have read the book, you can go further in depth in the topics that interested you. A great idea. Collapse explains in plain English the tenets of Sustainable Development and a lot much more. Just for this, I believe it should be mandatory reading in each family. On top of that, the book is extremely interesting and extensively panoramic. It gives thousands of interesting facts on societies coming from the almost all regions of the world. Dr. Jared Diamond’s previous book, “Guns, Germs, and Steel” won the Pulitzer Prize and I will probably read and review it. This sheer genius speaks a dozen languages, is a teacher at UCLA and provides here a great History class for a ridiculously low price. Dr. Diamond’s pages at the Lavin Agency and at the UCLA Department of Geography. Merci Edouard, ca a l’air intéressant, je viens de l’ajouter à ma liste de trucs à lire! I remember having to watch Jared Diamond videos in history class. I always left impressed with his theories, and once again I am impressed. He seems to summed it up nicely. We really do have a lot to worry about if he want to sustain our earth, and every little reduction in each person’s ecological footprint will make the difference. With the internet, information is available instantly, and I think that because of this, our chances to succeed are actually better than many of the pessimistic predictions. Information exchange and action is what will save our modern planet.